In the course of looking for something else, I came across some great evidence in my mule housing mystery. We have a collection of “Rice Special Occasion” photographs that came from the Baker family. Most, but not all, of these are Commencement pictures. I felt a moment of elation, but began to wonder again almost immediately. The first issue to deal with is that I can’t really tell what angle this picture is taken from. There aren’t any landmarks that I can use to identify the spot. But it occurred to me that because this is clearly so close to the main part of campus, there are likely to be other photos where you can get a glimpse of these buildings. 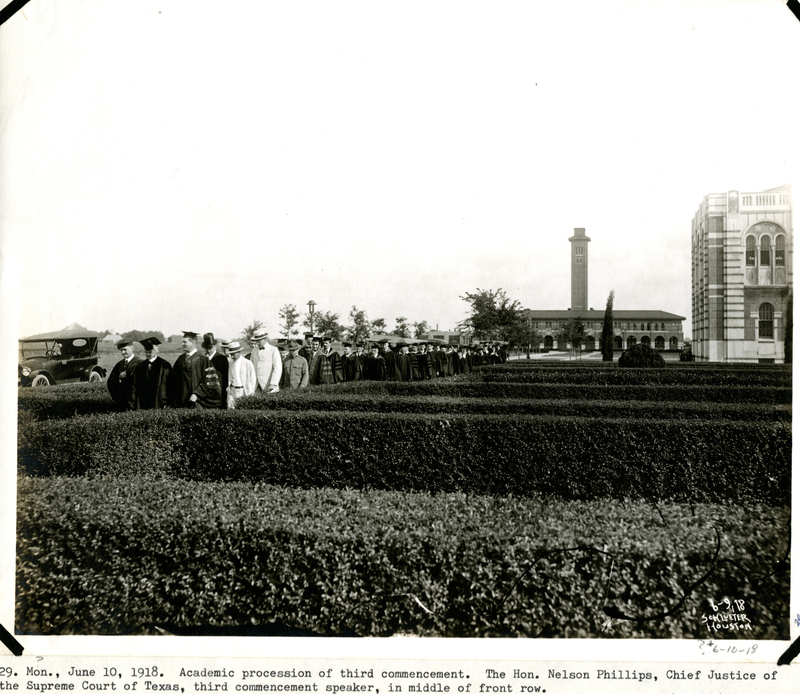 Sure enough, in this picture of the 1918 Commencement you can clearly see them in the background if you click to enlarge right over the top of the car parked on the left. 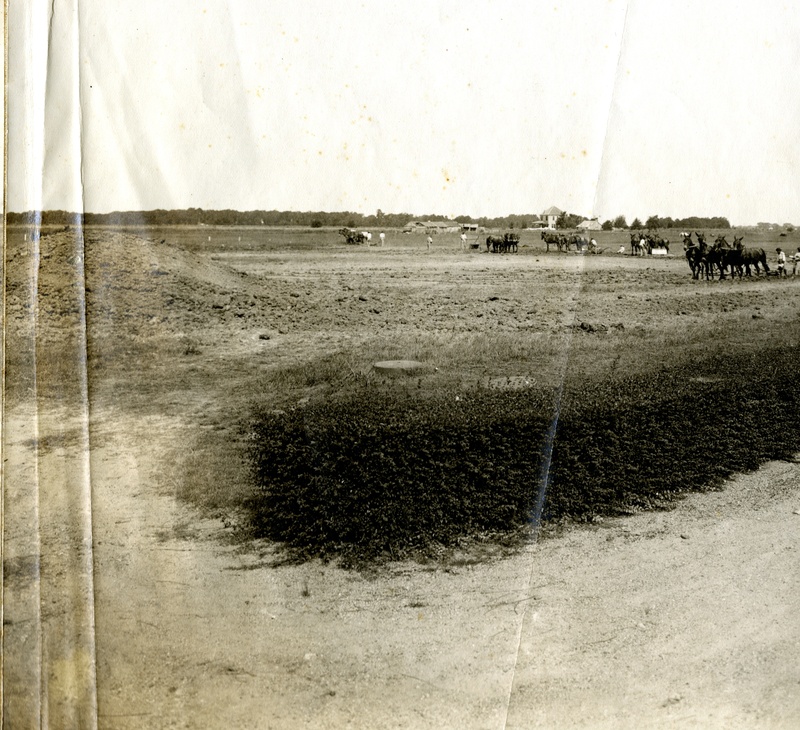 They look to be roughly where the Mudd Building is today. 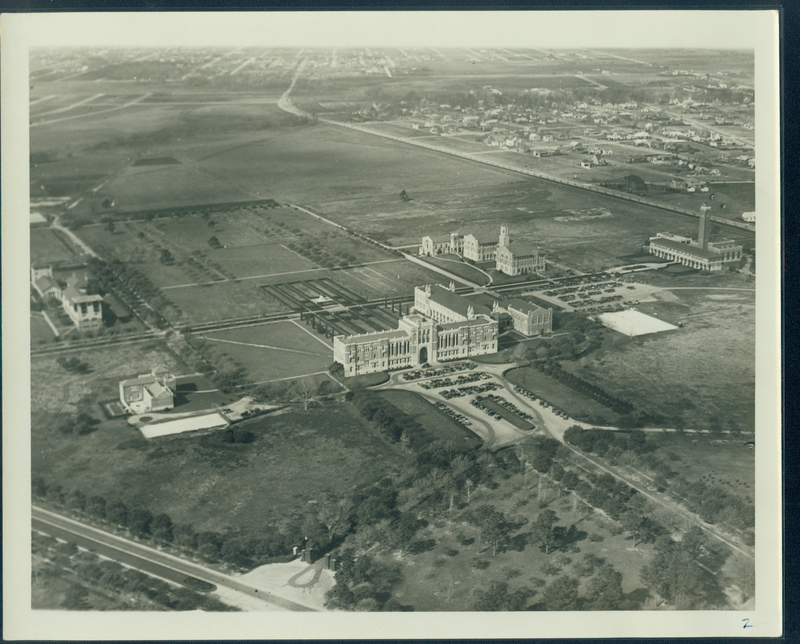 But if I go back to the early aerial photo of campus, which we figured was taken in the early 1930s, and zoom in behind the Chemistry Building none of it is there. It looks as if the site has only been cleared recently and you can still see what’s left of a driveway, but the buildings are gone. So, I’m still thinking about this. Any ideas? The big farmhouse that you can see in the two photos is likely on what is now Rice Boulevard, which was probably a dirt road back then. It was probably torn down when Southampton (the neighborhood north of campus) began to be developed in the 1920’s. I don’t have a clue about the location of the mule sheds, etc. You know what I’ve always been curious about … does Woodson have any old movie footage of events at Rice? Old newreels, home movies, that sort of thing. Other than footage from old football games, I’ve never seen anything other than still photos of the campus prior to the 1960’s. I think Rice is the greatest university in the Nation and I love the history and photos you do in your articles. Keep up the good work, excellent job. Melissa, It would seem to me that you would place a large number of mules about as far away from where you would study, eat, and sleep as possible. You would also place them in the opposite corner from prevailing wind directions. I would also think they would leave some pretty rich soil and there is an enticingly green patch in the far left corner of the 1930’s aerial. I am not saying this is the spot, but I would begin looking at the extremes of the property. All the Best. I think you’re absolutely right. I just found another aerial photo that I think fits with exactly what you’re saying. I’ll have time to post it this weekend. And thanks for reading and commenting! My pleasure. You are linked to Alan Shelby’s sports blog and I have enjoyed your posts. Brilliant stuff.